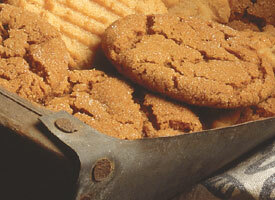 Try these delicious old fashioned molasses crinkle cookies. Put oven racks in upper and lower thirds of oven and preheat oven to 375°F. Roll 1 heaping teaspoon of dough into a 1-inch ball with wet hands, then dip 1 end of ball in sanding sugar. Make more cookies in same manner, arranging them, sugared side up, 2 inches apart on 2 ungreased baking sheets.